on their first rafting expedition Monday. The troop's "Five Rivers in Five Days" Camp Daniel Boone contingent — Junior Assistant Scoutmaster Ethan, Assistant Senior Patrol Leader Davis, and Assistant Scoutmaster Jason Smith — are enjoying some of the "wildest rides a commercial trip can offer" as a result of rainy evenings the past couple of nights in the eastern North Carolina area. From Wednesday through Friday morning, another two or three inches of rain are expected, which promise to make their most challenging leg of the trip — the Section IV leg of the Chattooga River and its Class IV-V rapids — a rafting trip to remember. The trio eat at the camp's dining hall for breakfast and dinner, and spend the rest of the time traveling to and rafting on each of the five rivers that make up the week-long high-adventure trip. Wednesday's itinerary includes Class III and Class IV sections of the Upper Pigeon River, as well as an afternoon hike to an area that provides some cliff-jumping into the river. from the boat; and fish...it's what's for dinner! other rafters from their campsite. They've expanded their social circle by befriending other Scouts in their campsite — all of whom are participating in the "Five Rivers" program. 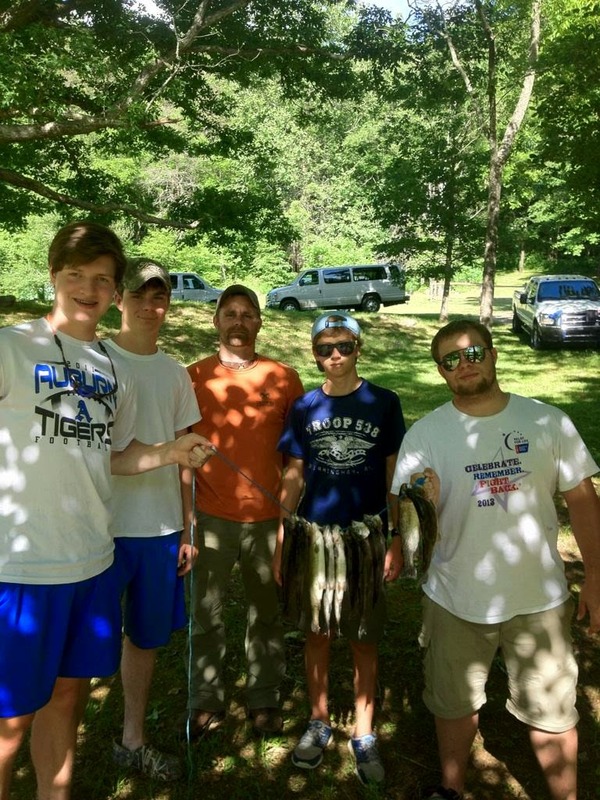 Together, they've banded together to supplement the camp's dining hall offerings by fishing in Camp Daniel Boone's lake and grilling the day's catch in their campsite. Assistant Scoutmaster Smith reports that the group of around 20 Scouts plan to coordinate their fishing and cooking efforts for tonight's dinner. Get a recap of the entire trip by checking out all the posts from the troop's Five Rivers in Five Days trip!